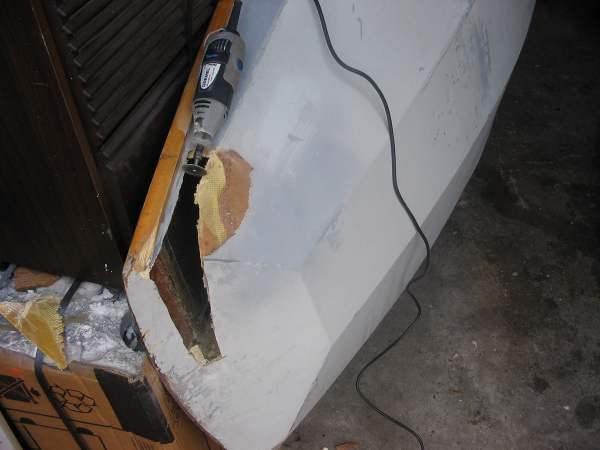 Poor Dogbolter, an Australian-built Fireball dinghy, came off a bit the worse for wear after a collision. The damage is on the port bow, where the three chines meet. Dogbolter won the 1990 Fireball World Championships at Enoshima, Japan in the hands of Australia's John Dransfield and Andy Perry. 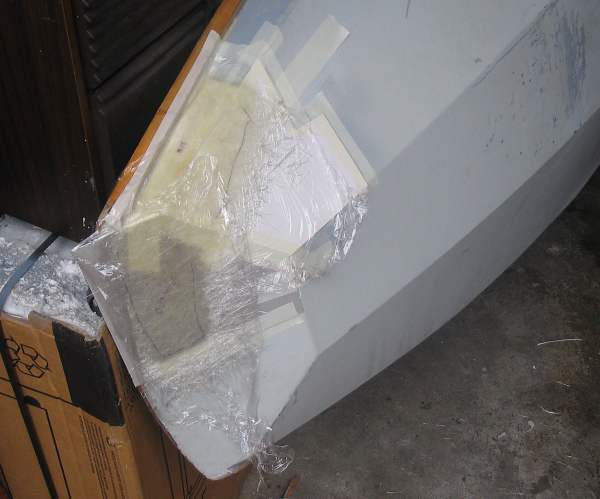 The boat is brought into the garage, and laid secure on its starboard side to allow easy access to the portside bow. 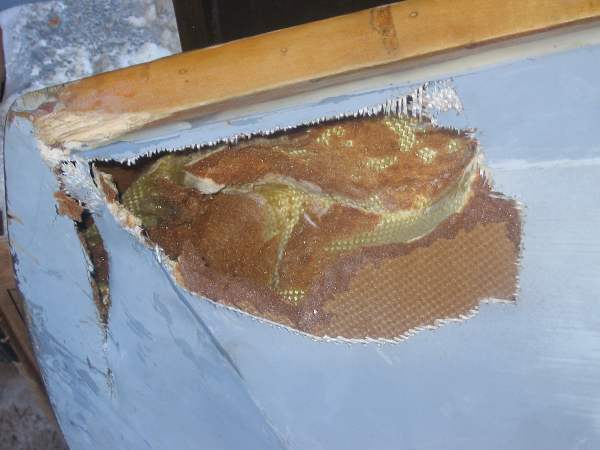 Another view, that's yellow Kevlar cloth on the inside which has de-laminated from the foam core. Always worth a peek inside. Very tidy construction. 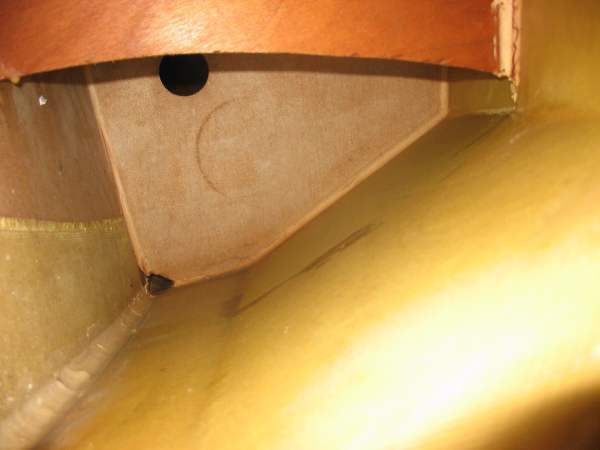 Kevlar wrapping inside the hull and up on the centre line stringer at left. Plywood thwart at top is a deck support. 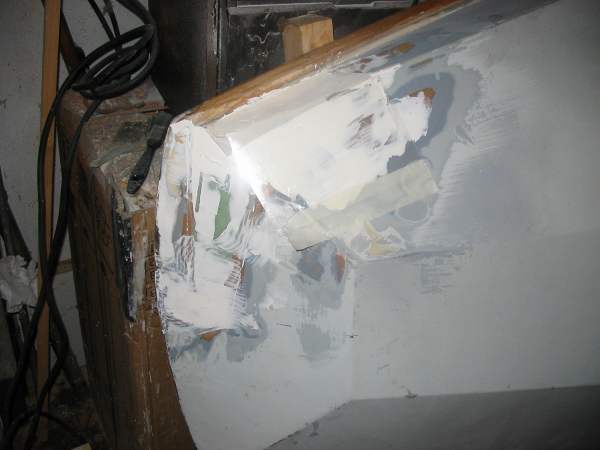 The repair requires a "blind backing piece" to be made of grp. Three pieces of cardboard are used to make the three chine corner. We used the un-damaged starboard side to trace the card, then turned them over to acquire the port side mirror image. Masking tape holds everything in place. The wound has been outlined in black marker. with thick cling film before rolling to laminate the two layers together. The three dimensional three chine blind backing piece has been trimmed to fit the wound. Testing to ensure a good fit inside. 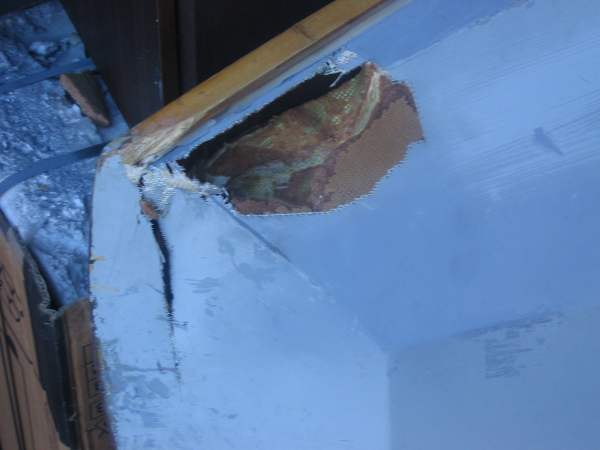 Brown area is solid undamaged foam with loose outer layer of glass carved away. 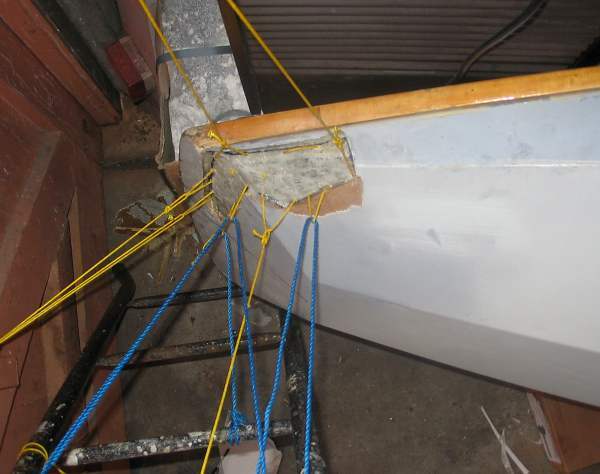 Thickened epoxy resin has been applied to the inside border of the wound, the blind backing piece has been inserted and the yellow strings pull it tight to ensure good adhesion to the inside of the hull. The strings are attached to a stepladder and the garage ceiling. 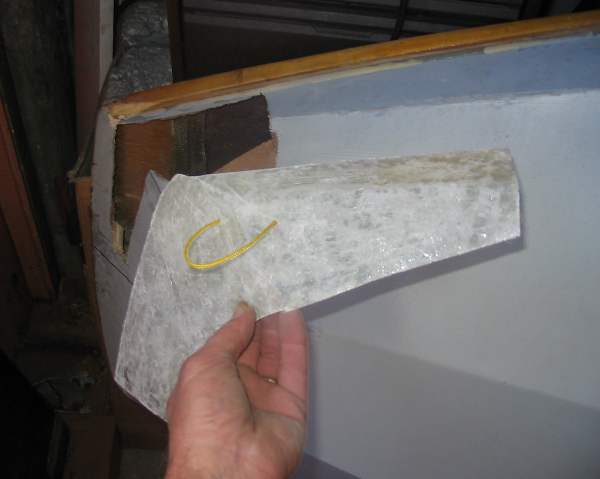 When the epoxy has cured, all of the strings will be cut away and we can begin to laminate foam and an outer layer of e-glass. 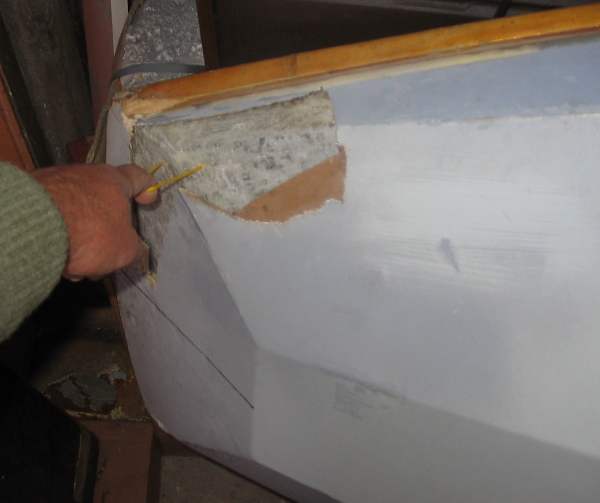 A piece of foam has been cut to fit the gap in the bow panel. The foam has been glued in place with epoxy resin. Masking tape serves to hold the foam sheet tight as the epoxy cures overnight. 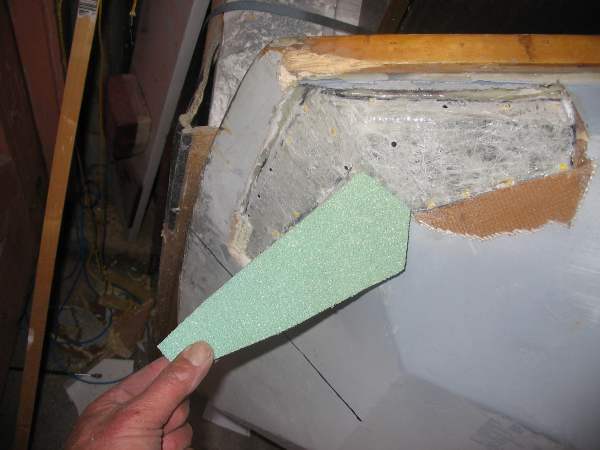 Around the green foam, the outer layer of glass has been trimmed away from the brown foam to allow an overlapping layer of new glass later. 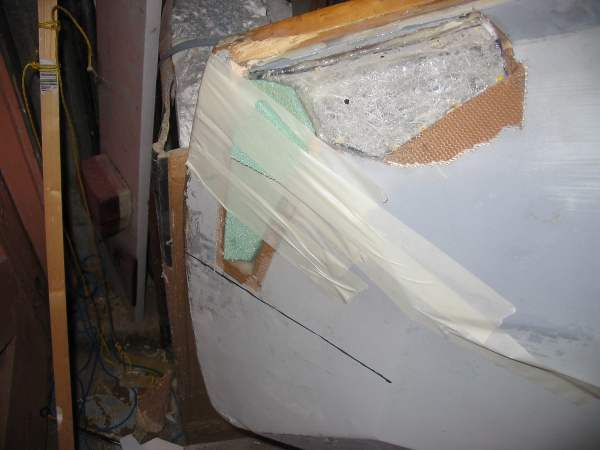 A second piece of foam has been set into place on the port side panel. Cardboard templates (yesterday's frozen pizza) are used to align the three chine corner. 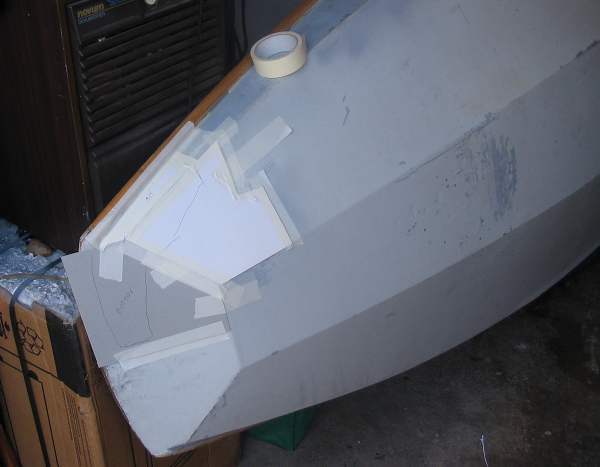 With the e-glass layer cured, a bit of sanding followed by a layer of filler, first step in fairing the repair. I like to use stiff acetate film on top of the freshly applied filler, to force the filler in place and leave a smooth finish, easy to sand and fair. All faired - wet sanded with 320 grade paper. 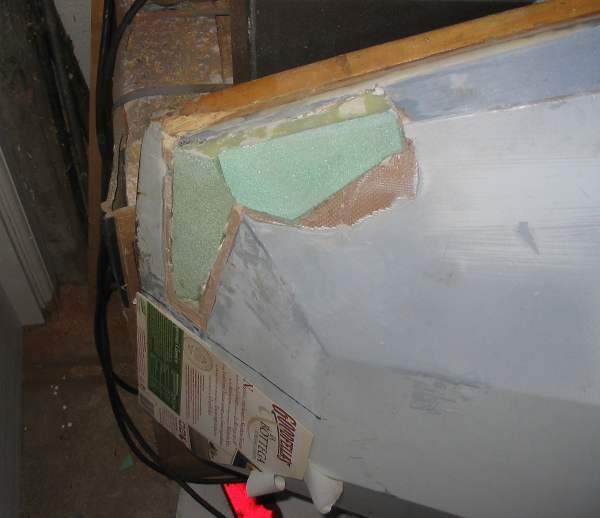 The brown is the original foam core laminate, green is my repair, white my filler. 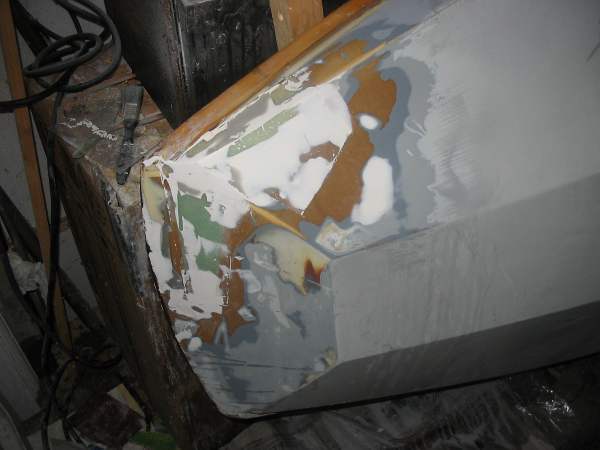 It seems that, when the boat was built, paint was sprayed onto the hull after construction, rather than using gelcoat in the mould. 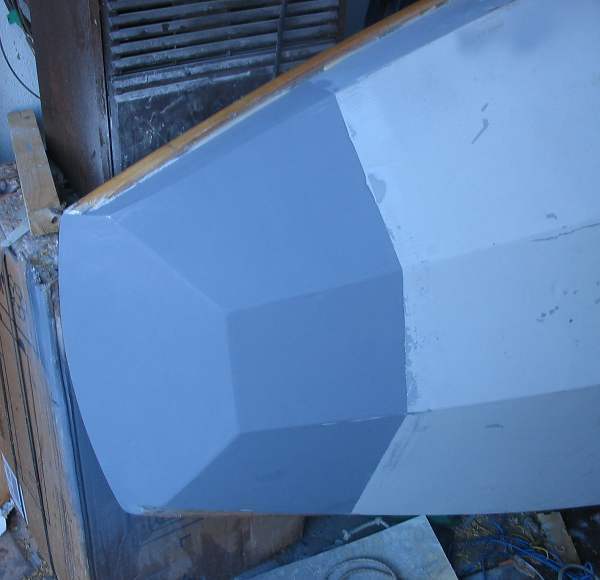 The dark grey seems to be primer, the middle grey the original finish and the light grey has been brushed on then sanded. Ready to mask and apply gelcoat. 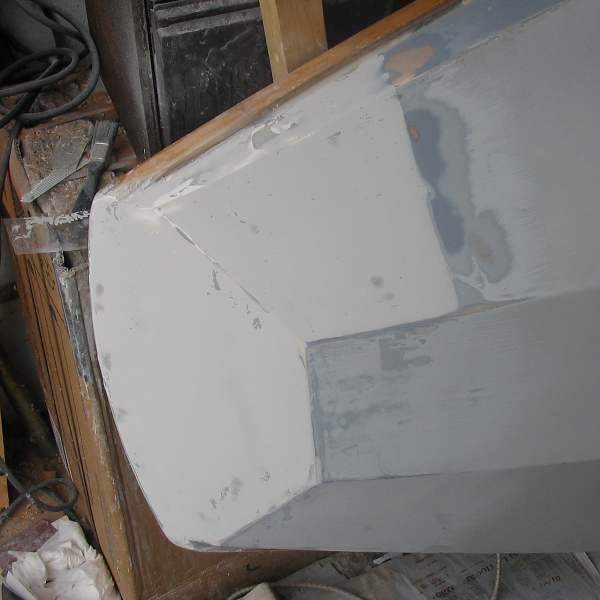 Gelcoat (Winder grey) has dried and has been sanded, small imperfections filled with grey filler and sanded again. Ready to be masked for spray painting. Finished, after spraying with good quality paint, then wet sanded with 1200 grade paper. It appears blue because the camera flash is off. Trust me, the colour is grey! And, the before picture, again.